Welcome to my blog! Today I am celebrating the launch of a brand new online Christian Creative Community: His Kingdom Come. A team of talented Christian artists have come together to launch this exciting new community and I am one of the moderators for the “Crafts, Cards & Stamping” group. His Kingdom Come is an online Community where fellow Christians can encourage, share and learn about Christianity and explore the God-given creativity that he has put in us all. It will be a safe place to share your faith, be inspired, and explore creativity across many art mediums – journaling, mixed media, painting, bible journaling, textiles, watercolor and more. His Kingdom Come will offer free tutorials, technique classes, devotionals, crafts to celebrate the holidays, opportunities to go deeper in your faith and in your knowledge of God and the Bible. The website will also offer Christian artists a platform to host classes (free or fee-based) which you will be able to sign up for. 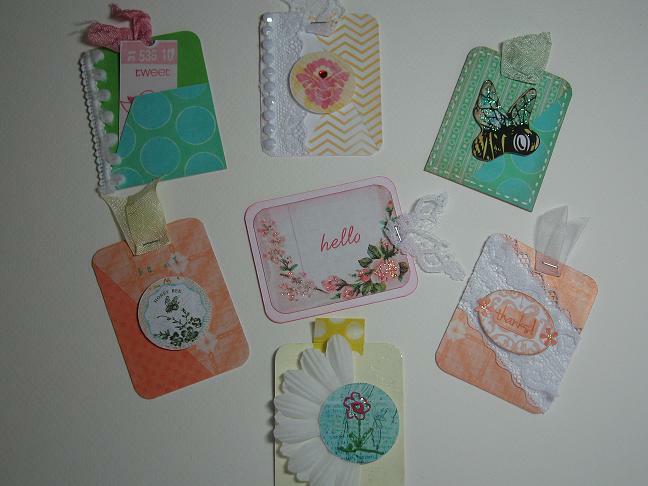 I will be one of the moderators for the “Crafts, Cards & Stamping” group. I wanted to share a little about who I am and my creativity! I have been married to the man of my dreams, Jack, for 45 years this November. Together we have 4 grown children and 7 grandchildren. I am a life-long Christian and love the Lord beyond measure. Sharing my faith with others, especially our grandchildren, is such a privilege and responsibility that I don’t take lightly. I am an avid crafter and have been my entire life. I learned to sew at an early age and that grew into quilting as an adult. I discovered stamping, card making and paper crafts 13 years ago and can honestly say that is my favorite form of crafting now. I taught stamping as an independent demonstrator for 8 years and left that company 5 years ago. Since then I have enjoyed many forms of paper arts including faith art journaling which was introduced to me by Diane Marra via her inspirational blog, Adore Him Creations, and videos. As with everything in my life, God is the center. All gifts come from Him and I hope that my faith shows through with each and every project. Whether I make a birthday card with balloons, a tag with girly frills, a faith art journal page that will focus on scripture or anything else, I know that God is there helping and inspiring me all along the way. Why did you accept the moderator position for this group? I saw a You Tube video from Shonna Bucaroff & Diane Marra announcing this wonderful new community and knew I wanted to be an active participant. They indicated that there were volunteer positions available for those interested in becoming a Moderator. As with so many things in my life, I felt God had his hand on my heart leading me first to the community then wanting me to apply. I sent an email off immediately asking to be considered. I can’t say exactly why I wanted this so badly, but just knew in my heart that it was something God wanted me to do. What do you want the group to be, do, etc. I would love to see everyone participate and I feel strongly that everyone has something to contribute both craft-wise as well as spiritually. We can all learn from each other and have fun sharing in the process. Swaps have become quite popular over the past few years and that is something I would love to integrate into this group. I have several projects in mind that I plan to introduce in January after the busy Thanksgiving and Christmas holidays. The first ongoing project will be called “Pray it Forward”. 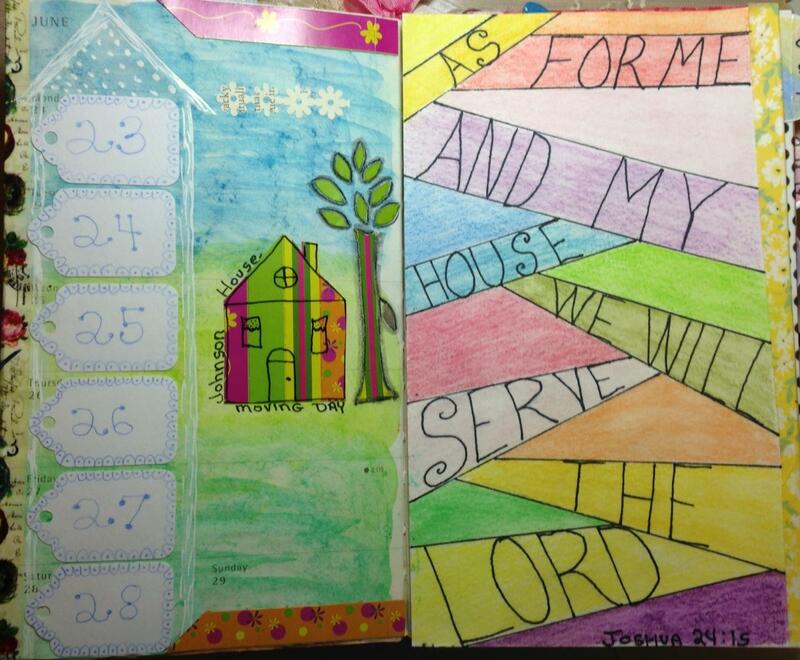 This will combine scripture, prayer and sharing a small art project. Details of this will be post the first week in January. 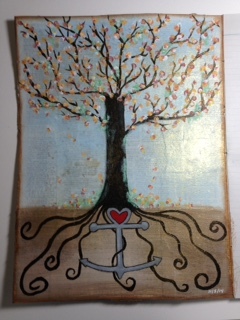 In addition we will be having a monthly ATC swap that will go hand-in-hand with Diane Marra’s year-long “Take Me Deeper” Faithart Journaling class. Diane thought this would be a perfect mix of creating both a journal page along with a matching ATC and I whole-heartedly agree. We may have a challenge or two along the way as well other swaps, so please stay connected for those announcements. Crafting is something I have done my entire life and has been in many forms. I learned to sew from my Mother at an early age and at that time I typically made clothing. 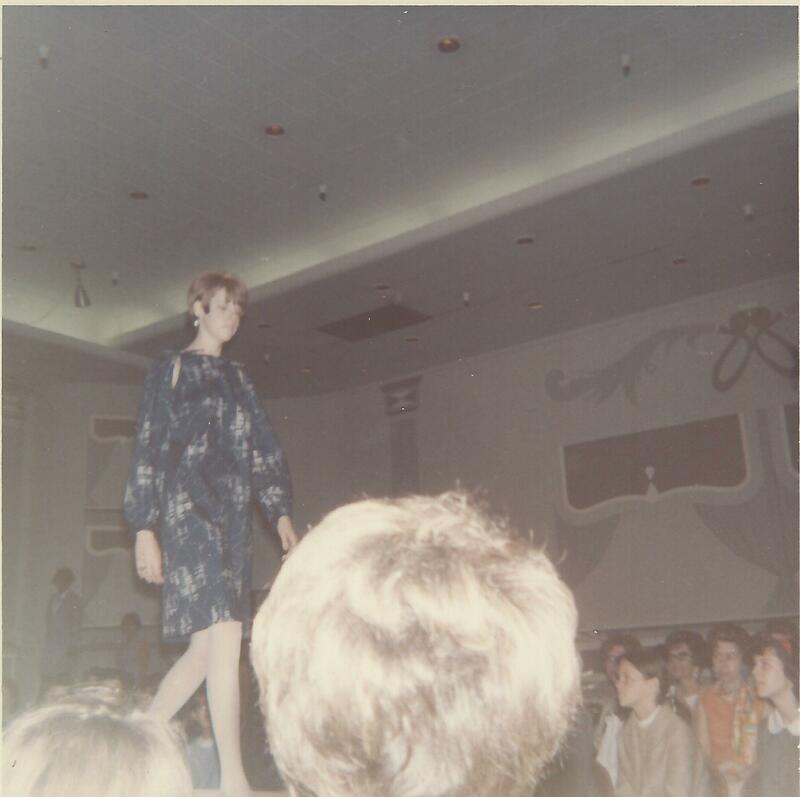 During high school I was chosen by our sewing teacher, Mrs. Survant, to participate in a local downtown department store’s fashion show where we sewed our outfits and then modeled them (picture below of that event). Mrs. Survant taught us to turn the garment inside out and check the construction first; she was critical and taught us to be as well. That may be where my eye for detail first was developed. After we were married I continued making clothing for our family as a young mother of 4 and often took classes along the way. Stretch and Sew became very popular in the 70s because they taught a way to make t-shirts in 30 minutes. I took many of those classes and still have the manuals, patterns and my notes. From there I taught myself to quilt and enjoyed cutting up a variety of fabrics to make beautiful creations. Yes, that’s me in 1967 modeling the dress I made. Over the years I took a variety of classes that were held locally including decoupage, ceramics and cake decorating to name a few. My introduction to rubber stamping and paper crafting about 14 years ago became my absolutely favorite type of crafting and that love remains to this day. I have made books, cards, banners, gift bags and boxes and have loved every minute of it. I was introduced to faith art journaling by Diane Marra on her You Tube channel and through her I learned to incorporate scripture and art. Through her I learned Faithart Journaling and that took on a whole new meaning of crafting to me. This is probably way more information that you would expect or even want to read about, but that is just me, I tend to offer more information than is required sometimes. That maybe a good thing though as I remember hearing at a retreat once to do more than we are expected to do…..
With so much negativity surrounding us from every direction these days, I would love to see this community thrive with faith-filled individuals who uplift each other through prayer, faith and art. I pray that His-Kingdom-Come grows by leaps and bounds and through everyone’s artwork and positivity bring many closer to God. For those who may not know, I started a You Tube channel earlier this year also called Craftoncue. I have many crafty pins on craftlin Pinterest page. Please remember to comment on my post here on my blog and join our community www.his-kingdom-come.com . We will randomly choose one lucky winner from the people who joined our community today to win a great prize . I hope you are as excited as I am at being part of this online venture. Our vision is to build an online community not just be a project-led site. A place where you can find encouragement, share your heart and your problems and find inspiration and friendship. 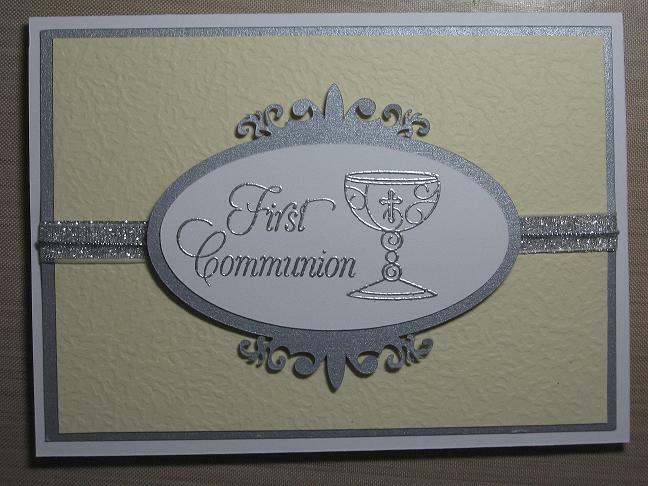 Our family will be celebrating our grandson’s First Communion in April. I wanted to get his card finished early since I still have to make his banner for church and his rosary. I will share both of those projects as they are completed, but in the meantime, here is the card I made for him. I must admit I was concerned going into this project about what I would do for this card. Carson’s favorite color is yellow so I wanted to use that color for sure. Once I figured out the other colors to compliment the yellow, the design was the next obstacle. I rented the Raisin Boat First Communion stamp set specifically for this card, so naturally that was the starting off spot. I auditioned different configurations until I came up with this. There are actually 3 ribbons that are layered behind the focal matte. The bottom layer is a sparkly silver ribbon which I liked but felt it needed to be toned down just a bit. The next layer of sheer silver organza ribbon did the trick but I felt it needed something more so I added the thin line of silver cord and adhered all of the layers down. The matte is popped using dimensionals from Scrapbook Adhesives. It took 4 tries to get the sentiment and chalice to emboss nicely, but the extra effort was well worth it since I think it turned out perfect. Silver cardstock – Stampin’ Up! Ribbon and cord – Stampin’ Up! Silver embossing powder – Stampin’ Up! I have a quick card to share that went along with the shabby chic cheesecloth flowers I posted about yesterday. 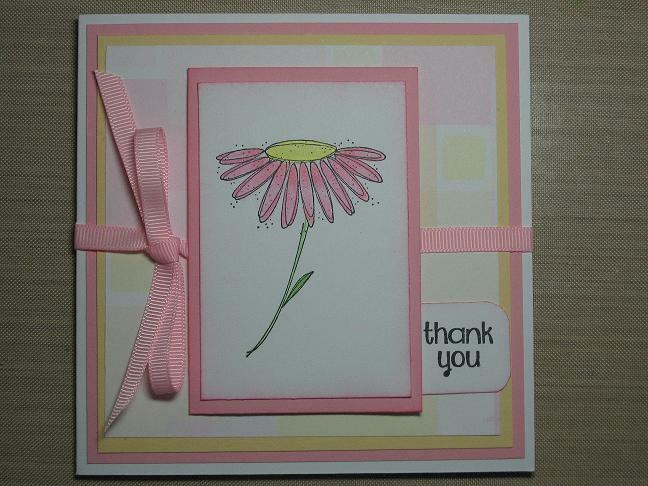 This is a thank you card that I made for the hostess of the Shabby Chic Cheesecloth Flower Swap at Your Paper Pantry. 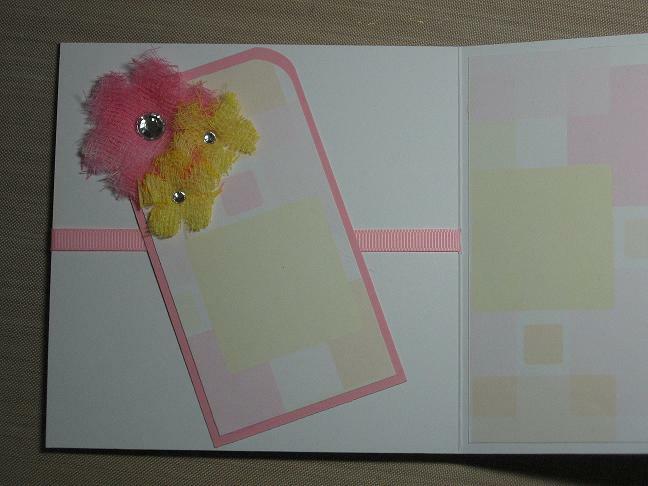 The paper matches the colors I used for the cheesecloth flowers as well as the card used to present the flowers. I decided to make a removable tag to add to the inside of the card and the flowers attached to the top are left over from the project. I thought adding a tag to the inside would be a fun element and usable as well. The flower on the front of the card was colored using my Prismacolor Pencils along with Gamsol. The sentiment is from The Stamps of Life, and the flower, cardstock, papers and ribbon are all from my stash and I believe are all Stampin’ Up! products. Memento black ink was used for the stamping. That’s my quick share for today. Even though I have had a ton of things going on this past month I couldn’t resist signing up for a different kind of challenge/swap (at least different for me) over at Your Paper Pantry. 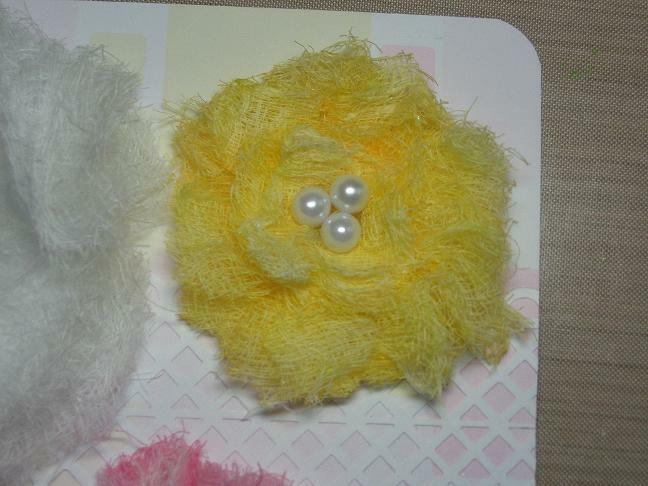 Participants were asked to make 2 sets of 3 flowers, with one being a larger flower and the other 2 smaller. Making cheesecloth flowers is something I knew nothing about so I went online and watched several tutorials to help me with my project. After quite a few attempts that turned to failure (my fault for sure), I decided to use my imagination and try a few things that I hoped would work. The first, and largest, flower I made is white and measures approximately 4″ in diameter. It was made simply using a large circle die from The Stamps of Life and cutting out many layers. Each layer is then adhered to the next using a glue gun, with a felt circle on the back for stability and looks. The center is a simple brad from Spare Parts. I really like how fluffy this flower is and love all of the layers as well. The second flower I made uses the Tim Holtz Tattered Florals die and is similar to one I saw on YT. Prior to putting the flower together I sprayed each of the layers with my homemade yellow glimmer mist. I also sprayed the layers with Aleene’s Fabric Stiffen to help the flower keep its shape (that idea I got from one of the YT vids too). I do like how it turned out and will try to make more of these in a variety of colors. 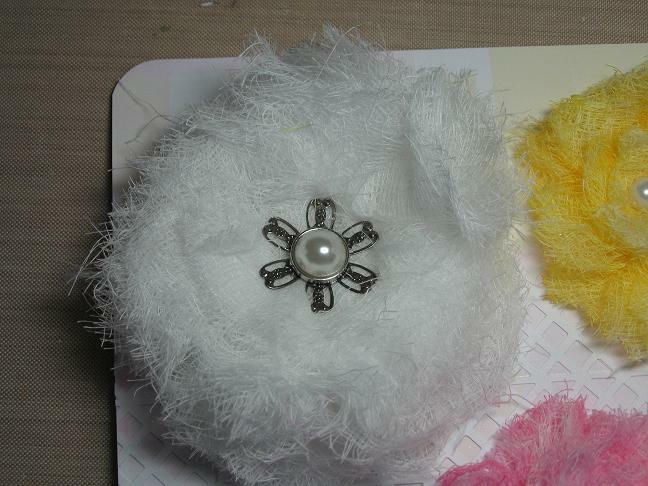 The final flower was inspired while I was looking at all the pieces of scrap cheesecloth sitting on my desk. I decided to try an idea I had and much to my surprise the flower turned out quite nice. The scraps were cut into strips and sprayed with my homemade pink glimmer mist. My glue gun was used to adhere the strips to a circle of felt by moving around the perimeter and working towards the center, squishing the cheesecloth along the way. 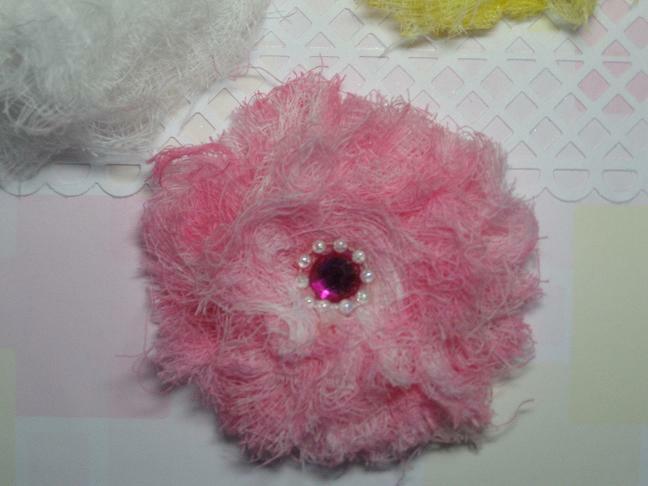 An added rhinestone colored pink with a Sharpie and outlined with a strip of pearls was used for the center. I was pleasantly surprised at the results and hope you like the flower too. I have more to share, but will keep this post short right now. The Documented Life is a wonderful project that began with 5 artists, Lorraine Bell, Sandy Keene, Rae Missigman, Barbara Moore and Robin Marie-Smith. I won’t go into how the project came to fruition since you can read about it directly from the artists on their blog called Art To The 5th. Suffice it to say it has taken mixed media lovers by storm. They have a very active Facebook Page where participants in the project post their wonderful creations and chit-chat about the project. You may be asking yourself why does the title say week 12 when this is the first time I’m seeing this here? The answer is quite simple, I just discovered this wonderful project a week or so ago and decided to jump on the band wagon even though I’m late getting started. With that being said, I do plan on backtracking the previous 11 weeks and create some mixed media pages and do a bit of journaling. For now I will to focus on the present week and give a quick synopsis of why I began this journey and how I put together this week’s pages. I saw a You Tube video about the Documented Life explaining how these journals encompass 3 elements, Daily Planning, Journaling and Mixed Media. I thought this was such a wonderful idea and went online that very same day to order my Moleskin Planner along with a pad of 90 lb watercolor paper and patiently waited for it to be delivered. I had some Washi Tape so I was ready to begin putting my journal together once everything arrived. With all my excitement to get started working on this weeks events along with creating my mixed media page, I didn’t complete adding all the watercolor pages to the planner yet. I hope to get the rest of the watercolor paper taped in along with the monthly tabs prior to next week’s entry. My plan is to journal about blessings and positive things in my life and not write about day-to-day activities, although a few special occasions may show up every now and again. The mixed media part of the journal is definitely a journey for me. I have dabbled in my art journal over the past few years, but I have much to learn. I hope to grow in my knowledge of colors, layouts, backgrounds, textures and everything that is part of this wonderful segment of the art world as I travel on this journey. The first page was done with St. Patrick in mind since Monday the 17th was to celebrate his day. I am part Irish and wanted to dedicate a page to this wonderful Saint and for my Irish heritage. It is simple as simple can be, I first took yellow chalk and colored the entire page, then I took the shamrock depicting a short story about St. Patrick and adhered it to my page with Mod Podge. I love polka dots and thought it would be fun to do an outline around the shamrock with my paint pen. So far so good. Once I doodled semi-circles at the bottom of the page with my green paint pen it looked horrible and I thought I had ruined the page. Alas, gesso to the rescue. I took the gesso and dabbed it on the bottom with my finger then low and behold it started to mix with the green paint pen to make a wonderful color of green. 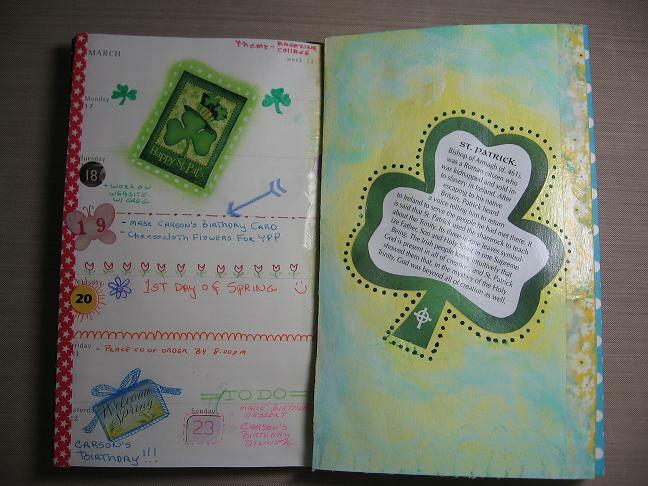 I really liked how it was turning out and painted it all around the page, leaving the bright yellow to surround the shamrock. Happy mistake for sure. I forgot to mention, each week there is a theme (or prompt) to get us started on our pages and this week the theme is “cut up something from a magazine and add”. 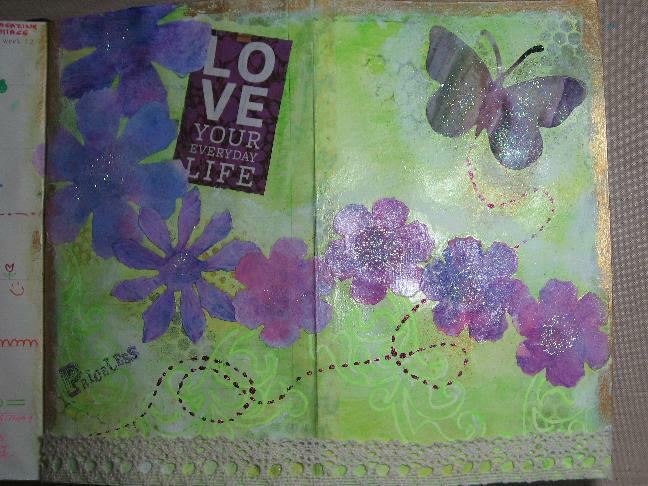 I used several items both on my mixed media page as well as my planner portion of the journal to complete this. The Happy St. Pat’s was originally a flag that I cut from a magazine. 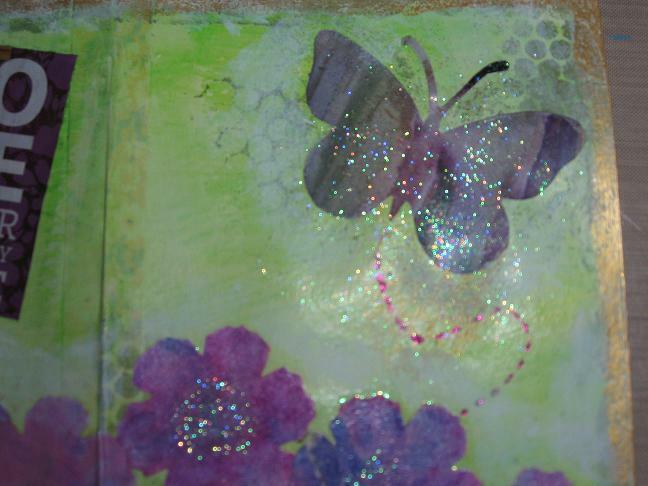 The sentiment and butterfly were also cut from magazines. The butterfly made by using one of my stencils and drawing around the open space then cutting it out from a magazine page. 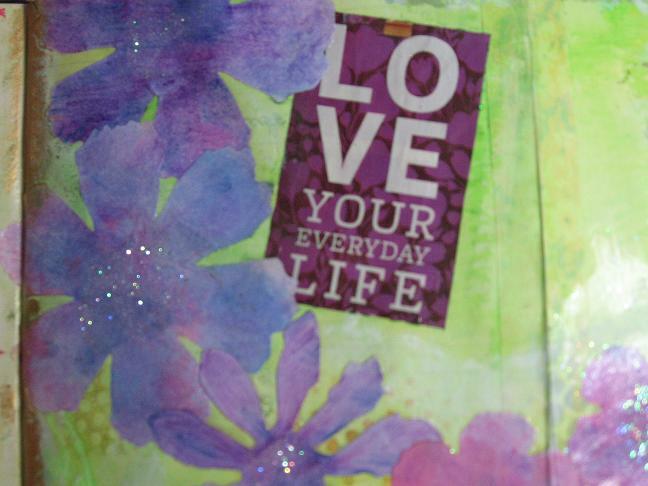 I really like the sentiment “Love your everyday life” and thought it was appropriate for my journal since I want to focus on positive thoughts and blessings. The flowers are simply copy paper colored with watercolor pencils and brushed with water. Each flower center is glittered as well as the butterfly. Stickles were used for the flight pattern and a bit of lace was added to the bottom of the page just because I love lace so much. There are several layers of paint, watercolor pencil and gesso for the background and border. I apologize in advance for the wordiness of this post, but I just couldn’t resist chatting about this fun new project I’m working on. 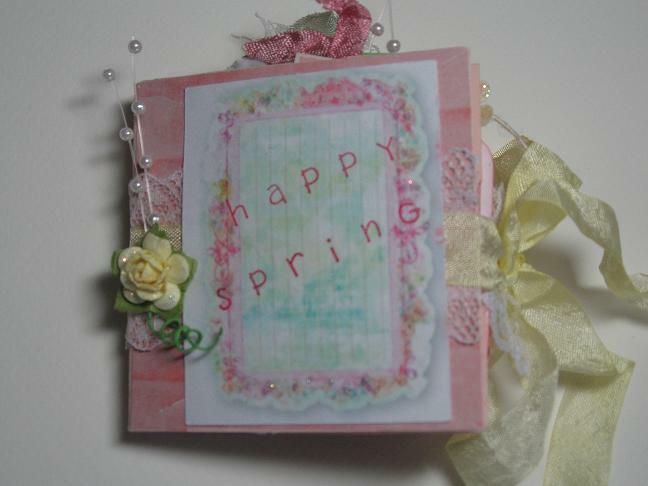 I love being the part of the community at Your Paper Pantry and decided to join the 75% Spring Challenge for February. This is how it works, the participants are given some paper and embellishments and are required to use 75% of those materials to make a project of your choice, using the theme of the month. This month the theme was Spring. The finished project is then sent to the Hostess of the challenge and we receive one of the other participant’s projects in return. Sounds simple doesn’t it? Yet for me it was fun yet quite intimidating at the same time. This is my first attempt at such an endeavor and it was truly a challenge for me. When I first received my packet with some 4″ x 4″ papers, a few short pieces of seam binding, washi tape (a must use item) and printed images, I worried what to make with these elements. 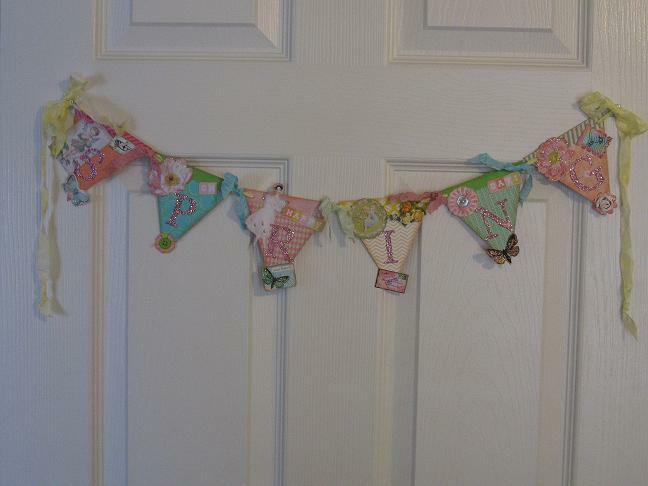 After a lot of thought, and even one sleepless night, it dawned on me to make a Spring banner. Why that thought came to me is a mystery since I have never made a banner before. Given the fact that the papers were so small I wondered if the banner would be an acceptable project to send in, yet I marched forward and started cutting and gluing. I worried if I cut something wrong I wouldn’t have any excess to work with, but still my resolve to make my project along with my commitment to the group kept me going. I thought the end result turned out rather well. 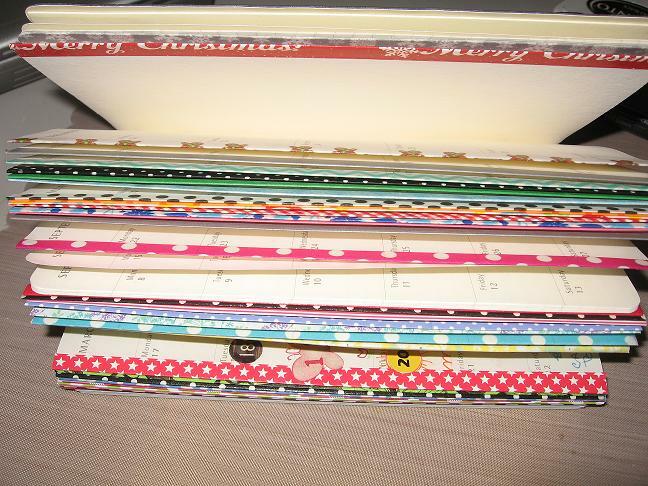 Then I had yet another dilemma, I still had some paper, albeit cut in odd shapes, a few images, a bit of the 3 colors of washi tape (less than 5″ in total) and a few tidbits of seam binding left over. Since we had to use 75% of the materials sent, I knew I needed to make another project. What to do with such odd shapes of paper and small bits and pieces caused me a bit of stress I must admit? Marching forward I decided to make a meandering mini album with tags. You guessed it, I never made a meandering mini tag album before, but I didn’t let that stop me, not at all. It was a huge challenge for me though as almost all of the leftover papers were cut in small triangles. It took 2 days of piecing everything together, including gluing and mitering edges of small pieces of paper on the front cover to make it look completely covered when in fact it wasn’t. I do like the end result of this mini album and tags and love the fact that I was able to use all but a few tidbits of the materials to make 2 projects. It was a creative challenge and a boatload of fun. I didn’t take pictures of each decorated page due to time restraints in getting everything packaged and mailed to Shelley in time, but I did take a moment to shoot the front cover along with the tags and those pictures are below. I worry if my projects will measure up to challenge, but at this point they are on their way and I just have to hope they will be OK. If you haven’t checked out the wonderful folks over at YPP, I would highly recommend you taking a look. It is the most positive place I have found, the projects are exceptional and the people are second to none. I love having a place to exchange ideas and learn about paper crafting and I hope you do too. I must admit that I’m rather late on the bandwagon when it comes to the Prima Doll Stamps. However, now that I’ve discovered them I am thrilled to have 2 that I can play with and make fun projects to share. Our youngest daughter celebrated her birthday last weekend and I wanted to use one of my Prima Doll Stamps to make her card (my first project using my new Prima Doll Stamps). Given the fact that they are approximately 8″ tall I thought cutting a card in the shape of a tag would work fine, and indeed it did. Even though you only see the front, it does open up in the usual card fashion to reveal a birthday sentiment along with a special note that my hubby wrote to her. I’m the card maker and he has a beautiful way with words so he always writes the sentiments. This dual effort makes each card we give to family and friends something from the heart from both of us. I love that. I used quite a few elements to make this card. The base card was cut using Vanilla card stock from Stampin’ Up! and layered with a pretty blue paper also from them. 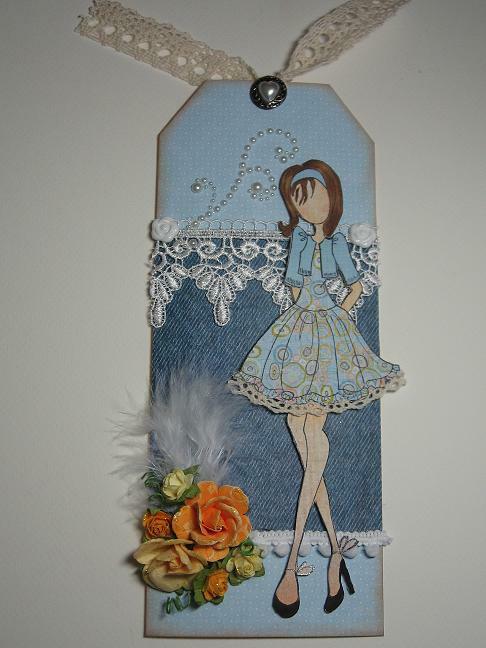 The denim paper is very old and is from Paper Pizazz, but I thought it went perfectly as the background for the doll. The paper pieced dress, headband and jacket is also from some very old papers I had in my stash. The doll was stamped on a piece of the Prima skin tones paper from their paper pack. I really like those papers. I am just learning how to color with Copic markers and used a few to color her skin and hair. A bit of cotton crochet lace that I cut in half was adhered at the hemline. The beautiful lace towards the top of the card is from a roll I purchased at WalMart awhile back and the white tiny ball trim is from Hobby Lobby. I love the pretty yellow flowers and they are all from Michaels, Recollections I believe, and the feather is either from JoAnns or Michaels. Distress Tea Dye was used to ink the edges and a pearl swirl along with little white flowers were included to help the design and add interest. It’s hard to see on this picture, but I used my glitter pen to accent the bows on her shoes. 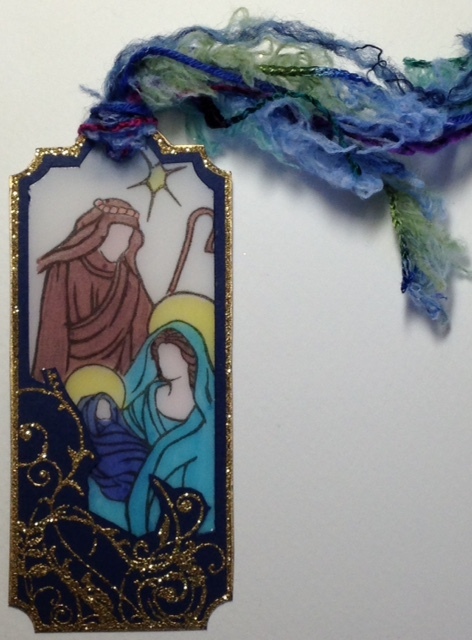 A small piece of lace was used at the top along with a pearl centered button which I just purchased from the Spare Parts line at Hobby Lobby. Of course, it wouldn’t be one of my projects without the addition of Stickles or glitter, so I tipped the roses with Diamond Stickles and called it a day. 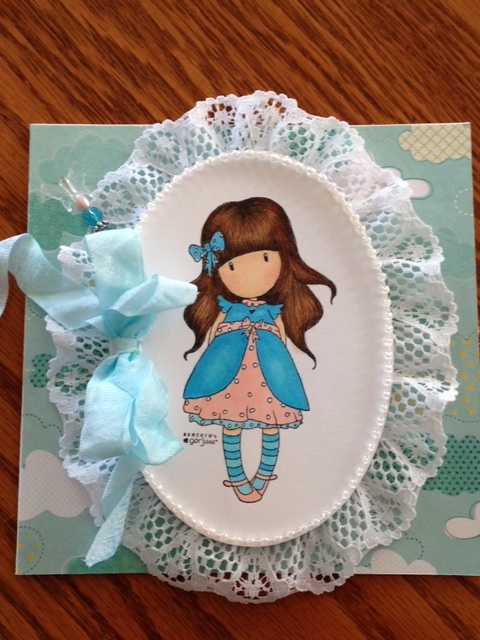 I am happy with my first Prima Doll project, and Jen absolutely loved her card which makes me happy. Another post will follow today showing some projects I made for Your Paper Pantry, but I didn’t want to add too many projects within one post. Thanks for visiting and until next time, God Bless.